The Beethoven Journey has been a four-year collaborative project between celebrated Norwegian pianist and 2013 Gramophone Hall of Fame inductee, Leif Ove Andsnes and the Mahler Chamber Orchestra. Together they have recorded all of the Beethoven Piano Concertos, as well as the Choral Fantasy, with Andsnes not only playing but also directing the orchestra from the keyboard. 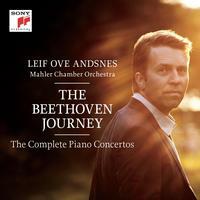 Although Andsnes has an extensive discography, The Beethoven Journey was his first Beethoven recording ever. The series began with the live recording of Piano Concertos 1 & 3 at the Prague Spring Festival in 2012, which was named iTunes Best Instrumental Album of 2012. This was followed by the live recording of Piano Concertos 2 & 4 in London in 2013 with the final album, Piano Concerto No. 5, recorded live once again at the Prague Spring Festival in 2014. Now, all three celebrated recordings are available together for the first time. Leif Ove will be performing an all Beethoven repertoire on his upcoming U.S. appearances in late 2014 and early 2015. The "New York Times" has called Leif Ove Andsnes "a pianist of magisterial elegance, power and insight." With his commanding technique and searching interpretations, Andsnes has won acclaim worldwide playing in the world's leading concert halls and with the world's leading orchestras. He has been nominated for eight Grammy Awards, five Gramophone Awards and was recently inducted into the Gramophone Hall of Fame, prompting the "Wall Street Journal" to call him "one of the most gifted musicians of his generation."